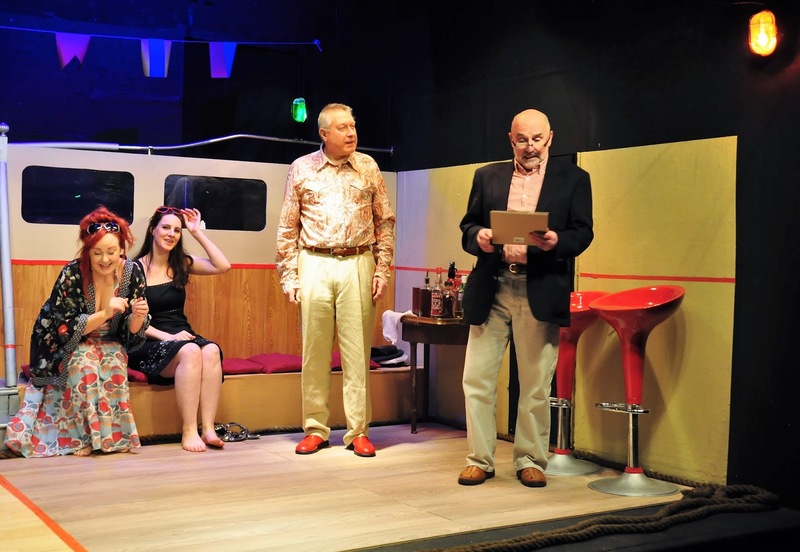 There is perhaps a certain inevitability that the amateurs of Northampton will provide a better play this year than Sextet, currently running at The Playhouse Theatre. However having said that, there might not be many on the stage that are as ambitiously optimistic of the skills of those local actors performing in it. 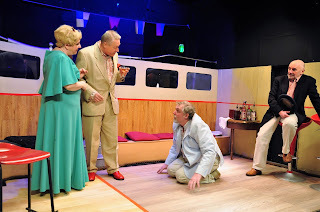 There is much to trouble an actor here, with Michael Pertwee's piece (very much of its seventies period) challenging timing, prat falls, prop management and a navigation of a complex set (especially so on the small Playhouse stage). The play itself as always with a character driven play, takes a while to get going. One by one we are introduced to the motley crew made up of family, business links and random people bumped into. 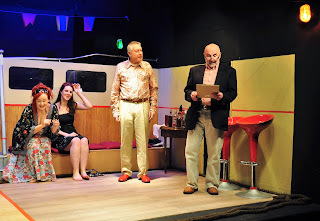 Our six characters (yes, there is a clue in the title), are the Captain of the yacht, Roger (Barry Dougall), his (ex/current) wife Lisa (Tamsyn Payne), then his guests Denys (Jem Clack), his wife Valerie (April Pardoe), Philip (Simon Rye) and his imported lady friend Mercy (Fiona Lee). What results in this gathering are frequent incorrect couplings, extra curricular activities in the "black hole of Calcutta" and mishaps and accidents, mostly courtesy of Denys. It is all rather silly and often dated stuff, but taken with a heavy dose of, this is what was written in the seventies, you get away with it, just. The audience sure enjoyed it, although often during the first half there were more groans at the jokes, rather than guffaws. The second act is substantially better as the character pieces often are once the setup is well and truly over, and some of the scenes in that second half are really excellent. The confrontation scene from Denys late in the play is filled with glorious comic exchanges and makes much of the build-up worthwhile. This coupled with the fascinating turn of pace, chicken scene, makes the whole play wrap up in a very satisfactory way. The cast are all rather wonderful. Jem Clack goes full-on into his accident prone Denys, laying risk of injury and hypothermia on the line at any moment. Timing and delivery are also spot-on. April Pardoe is also a delight as the really quite vile and unlikable Valerie (if that at all makes sense?). It is interesting on writer Michael Pertwee that he chose to actually bring both apparent good and bad result for this character, personally, I think bad and bad would have been the better. Simon Rye also impresses despite it being an often very challenging role at times, with so much interplay and maneuvering of props to deal with. He and his "companion" Mercy (Fiona Lee) have some interesting cabin maneuvers as well, sensibly played off stage, unlike what the script suggests. They actually work better this way, giving the audience the chance to imagine the predicaments. Barry Dougall, the man who never lets you down, is again brilliant as "Captain Bligh" Roger. Stressed and incredulous at every turn of events, he has, as always the perfect timing and mannerisms to milk all the humour out of the lines and situations. Finally though onto the glorious Tamsyn Payne. Long have I waited to see Tamsyn acting, as I felt sure that she would be superb. It wasn't a surprise therefore that she is more than a little brilliant, oozing character in a substantial way. She also has one of those slightly rarer elements of amateur actors, the ability to never switch off on stage, Even when not involved in the action, she is the perfect backdrop of facial reaction and behaviour to events. Truly brilliant in every way. 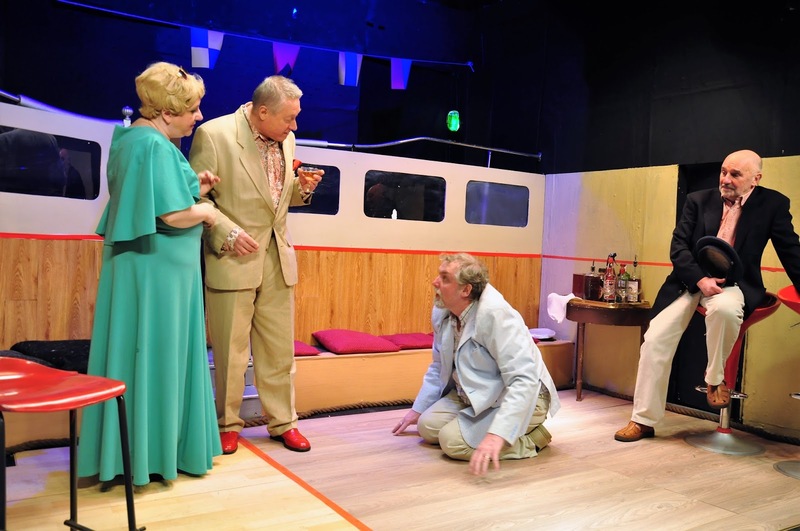 Also rather brilliant is the set from Mark Mortimer, once again breaking all logic to somehow cajole a yacht of some substance onto the diminutive stage, and more importantly making it reasonably safe for the actors. Director Philip Welsh has herded his cast to make this really complicated play work with all its ridiculous timing issues and prop management. It is no mean feat from him or the actors to make this work as well as it does. So sure, not the best play of its type and oh yes, it is horrendously dated and politically incorrect. However switching any morals off and embracing it for the time that is comes from, Sextet provides an entertaining evening of comic sexual relations. 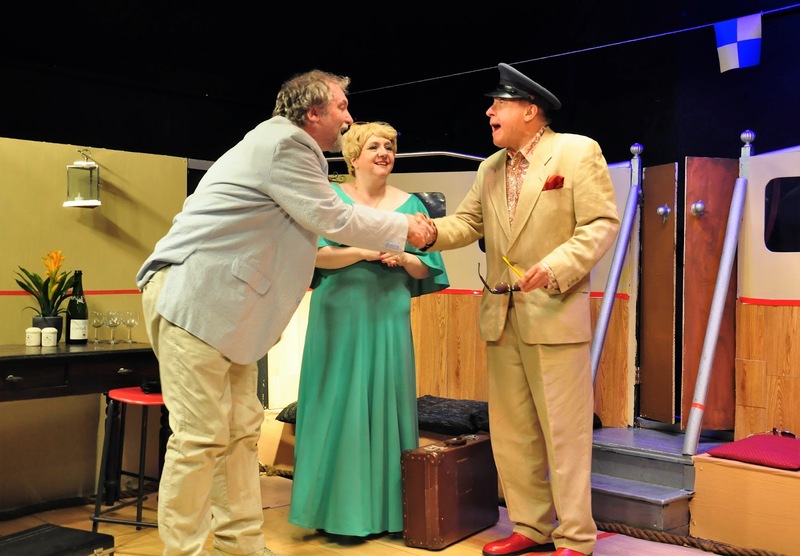 Sextet runs at the Playhouse Theatre, Northampton until Saturday 28th January, 2017.